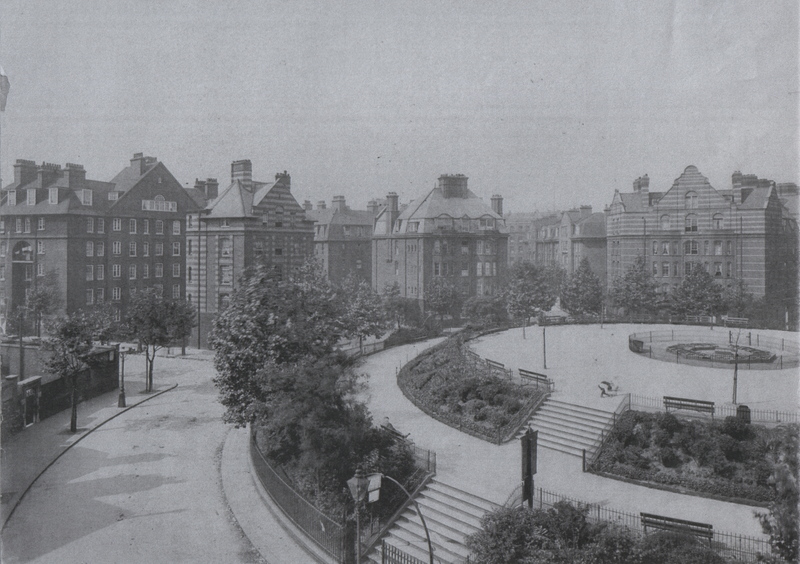 The Boundary Estate was Britain’s first council estate, raised from the rubble of one of London’s most notorious slums. 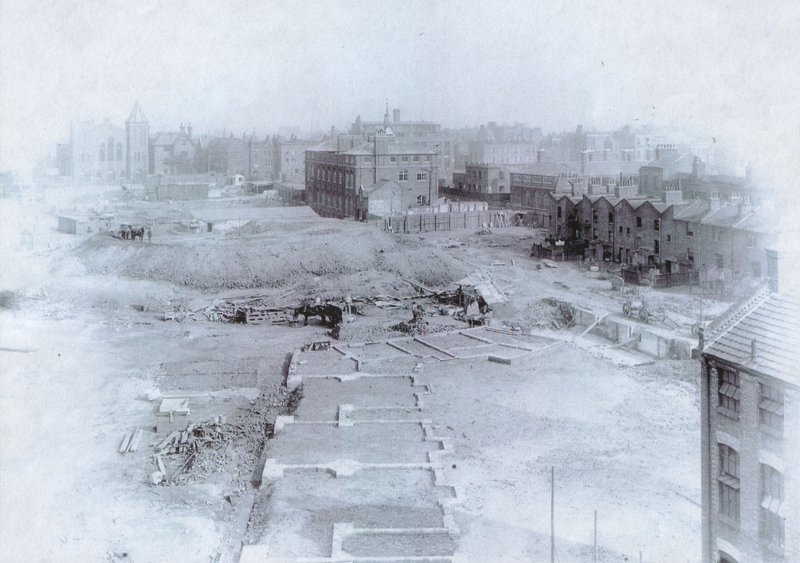 Here’s a brief history of that slum, and the factors that eventually led to the building of the Boundary Estate. In 1801 Britain was an embattled island, having spent most of the previous century at war with much of mainland Europe and the fledgling United States, and its financial situation was precarious. The first ever census was carried out, the West India Dock was nearing completion and London was a city of just over 1 million inhabitants. 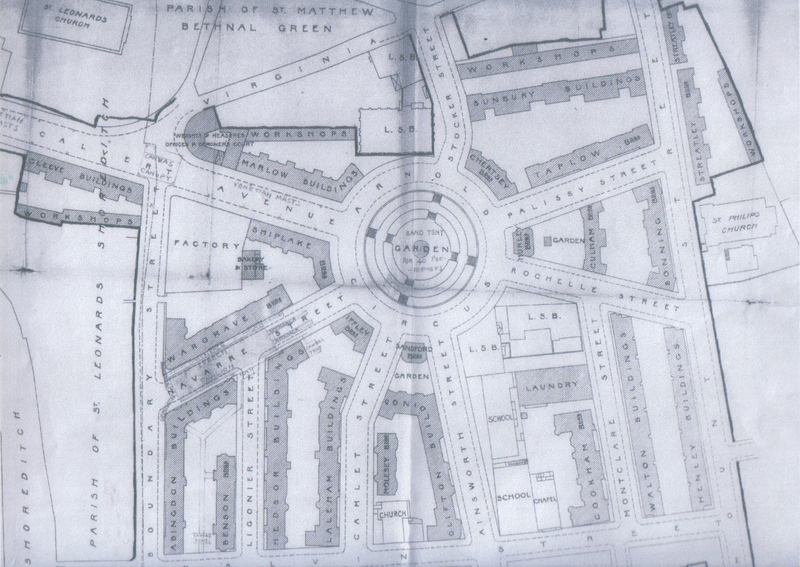 The area that was to become the Boundary Estate was a northern suburb of the city, already heavily built-up around what is now Redchurch Street and Old Nichol Street, and was home to a large artisan and semi-skilled workforce. 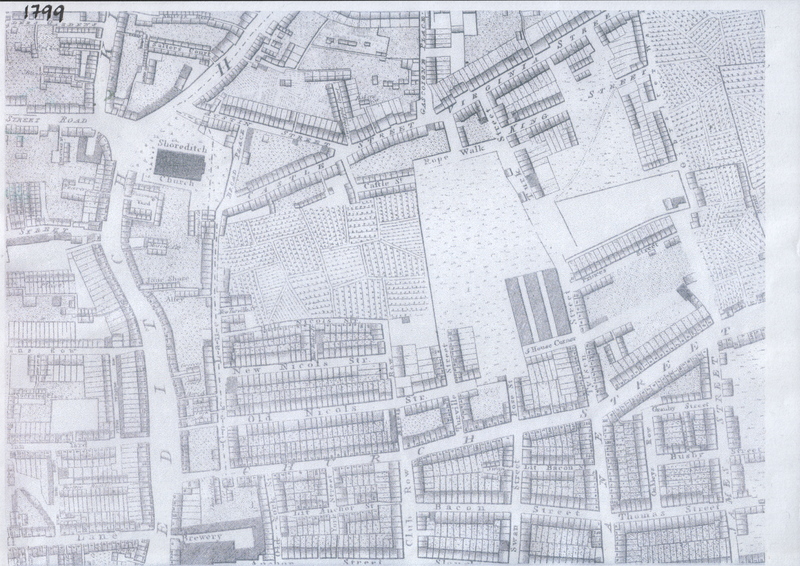 Just one street north of Old Nichol Street were market gardens, orchards and brick fields. By 1851 Britain ruled an empire that spanned the globe, and it was the richest and most powerful nation the world had ever seen. As the hub of Empire, London had an insatiable appetite for people and the population had more than doubled to 2.6 million. The former northern suburb was now The Old Nichol, a poor area where families of eight and more were known to live, and sometimes work, in one room, and any tiny open space was used to house costermonger carts or livestock – from chickens to dairy cattle and horses. Conditions in The Old Nichol had been deteriorating from the 1830s onwards, so that by the 1880s it had become known as the worst slum in London. The rapid growth of the city and the ever expanding unskilled workforce meant that cheap properties within easy reach of the centre of town were highly desirable, even in an area like The Old Nichol. A lack of enforceable housing laws combined with influential property owners, many of whom who were respectable local businessmen and officials and included the Church of England and peers of the realm, meant that little notice was paid to the state of the properties they rented out to the poor. Even though rents were extremely low, the numbers of people paying rent in each dwelling made the owners more money than properties in up-market neighbourhoods like Mayfair. 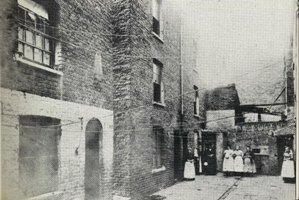 Large families, up to eight people in many cases, lived in one room of the small terraced houses like those illustrated below. 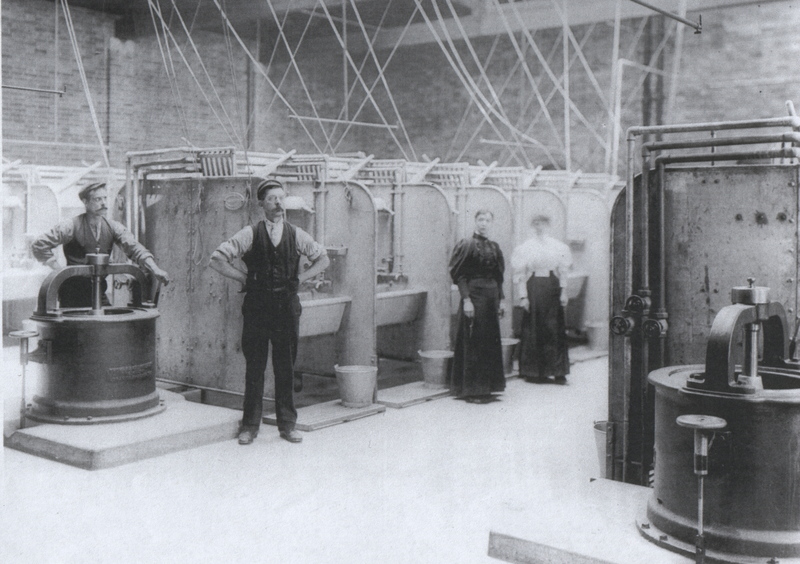 Water was from shared taps in insanitary yards, toilets were latrine-like pits, the windows were often broken or the frames rotten, and doors were frequently missing having been used for firewood. The properties were too hot in summer, too cold in winter and damp all year round. The Old Nichol’s population consisted mainly of families headed by men who were skilled and semi-skilled artisans, labourers and journeymen who were mostly employed on a piece-work or daily basis, and very poorly paid. Women frequently worked within the home, as weavers, seamstresses, laundresses and match girls, as did older children. Children between the ages of five and ten were required to attend the Board School although many were frequently absent, either because they were needed to help the family make enough money to pay the rent and eat or because they were too ill. The image of The Old Nichol as a no-go neighbourhood full of unemployed chancers prone to extreme criminality, vice and violence was wildly exaggerated – indeed some policemen were resident there and outsiders visited and took in the atmosphere of the local pubs unmolested! Certainly there were some courts and alleys that were very dangerous, where illegal gaming, dog- and cockfighting took place and prostitution was commonplace, but if you scratched the surface of any London neighbourhood at that time you would have found similar activities being carried out. Between 1885 and 1895 only one murder was committed in the Old Nichol, the murderer was caught and tried with local residents giving evidence. The assumption that poverty was due solely to lack of morality was slowly changing, but attitudes to those living in poverty were often harsh. Poor relief and the workhouse were to be dreaded, and many would choose to take their chances on the streets rather than be institutionalised within the prison-like workhouses or by accepting poor relief. As bad as The Old Nichol was, residents were at least free to make their own livings without petty regulations and could come and go as they pleased. Inevitably, given the poor housing conditions and lack of money, malnutrition and tuberculosis were rife, infant mortality was high and life expectancy was low. Petty criminality, such as shop-lifting food and picking pockets, was the only way many could survive. 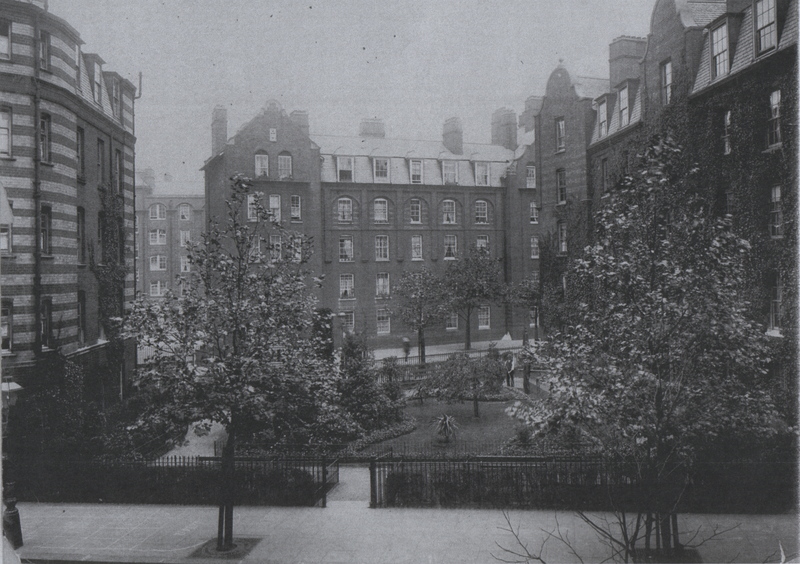 Church missionary societies and organisations such as Oxford House and Toynbee Hall undertook a ‘social work’ and health care role within the east end, drawn to the area because of the high levels of poverty and its proximity to the City. 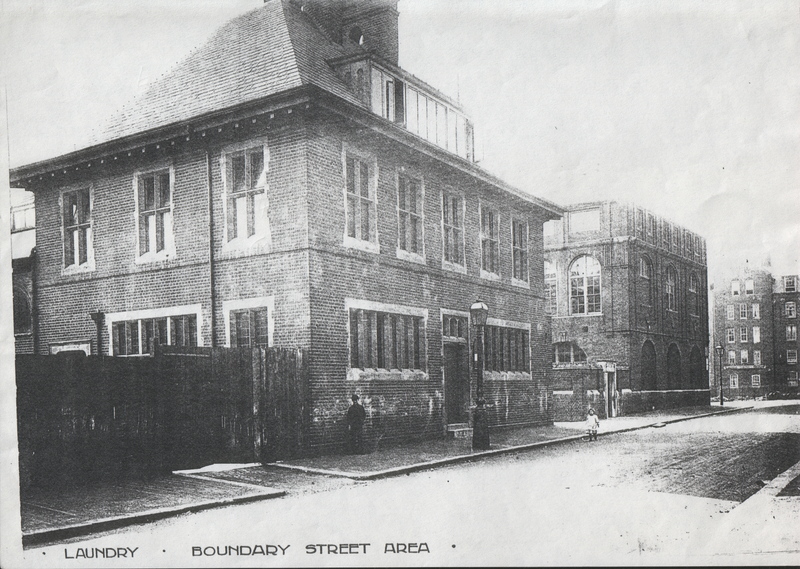 The Old Nichol also had Holy Trinity, an Anglican church and men’s social club with, unusually, a boxing gym, on Old Nichol Street, and the London City Mission’s Nichol Street Ragged School and Mission House on Nichol’s Row. The material and physical assistance such organisations provided was eagerly received, but the churches themselves were poorly attended. St. Philip’s Church on Mount Street was a major provider of assistance to Old Nichol residents, giving over 1,000 free dinners to pupils of the National School in winter, treating 600 parishioners to a Christmas feast each year, and 1,500 of the very poorest children and 500 or so aged and infirm adults on an annual summer day trip to Epping Forest. During the 1880s the plight of the poor and their housing were subjects of great debate, especially within the Church and amongst the more liberal politicians. Even the Royal family took up the issue, with the Prince of Wales speaking out against the conditions endured by residents of St. Pancras and Soho in the House of Lords in March 1884. Queen Victoria urged her Prime Minister, Gladstone, to order an enquiry. He reluctantly agreed, and a Royal Commission on the Housing of the Working Classes was established, and the Housing of the Working Classes Act swiftly followed in 1885. The Act had little impact until 1889, when the Metropolitan Board of Works was replaced by the London County Council. In 1891, with London’s population at over 5.5 million, Parliament passed the Public Health (London) Act and the Boundary Street Scheme Act. 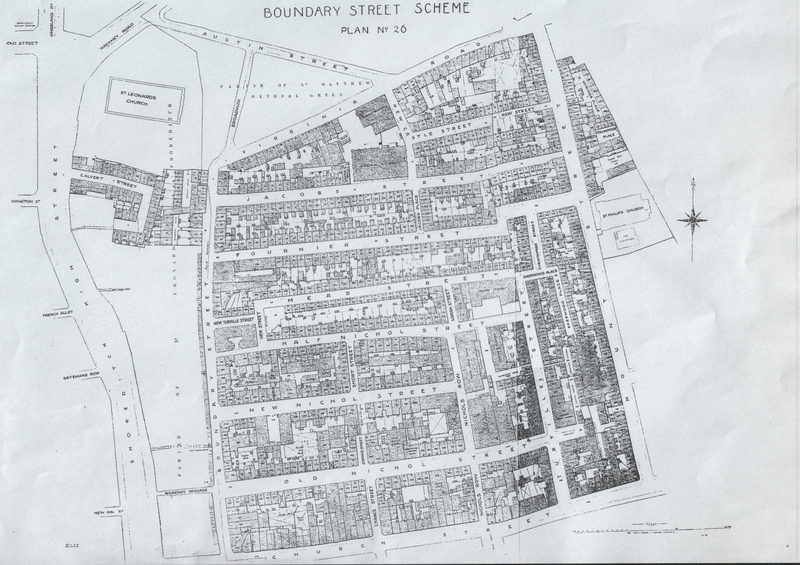 The Boundary Street Scheme may have sounded the death-knell for the Old Nichol, but the death throes lasted two years as property ownership was verified, owners were paid compensation and 5,700 people were evicted. The rat population exploded, ‘wreckers’ stripped the buildings of any usable materials and goods previous residents may have left, squatters moved in and mounted police patrolled the area due to rumours of organised criminal gangs using the area as a base to operate in Bethnal Green and Shoreditch. Demolition began during 1893, and building started during 1895. The design for the Boundary Street Estate was far removed from the usual housing for the poor. 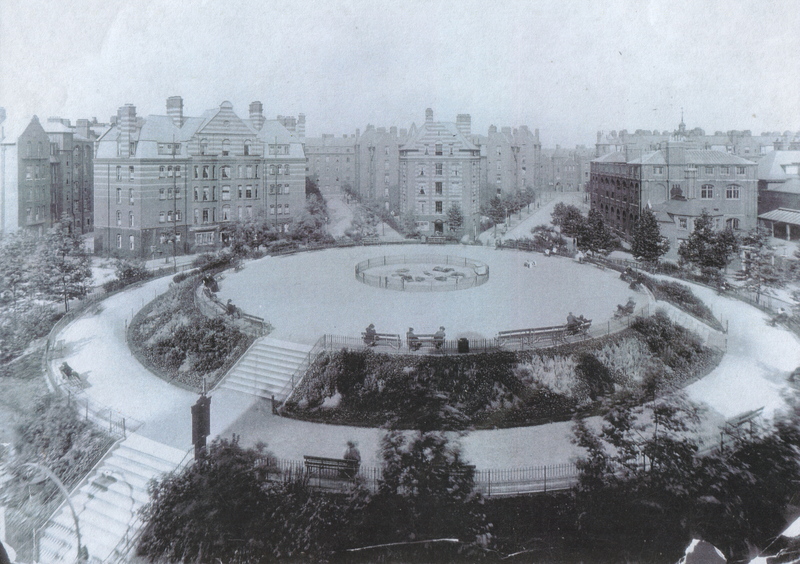 Four-storey mansion blocks of varying size were to be built along wide, tree lined streets radiating from a central garden, with shops, a laundry and workshops for residents, with the existing schools and churches included within the plan. It would be a model development providing all that the residents would need, it would be sanitary, open and airy – and dry. No pubs were included in the design and no shops would be able to sell liquor. The first block to be completed was Streetley Buildings on Mount Street, (demolished in 1967), with residents moving in during 1897. 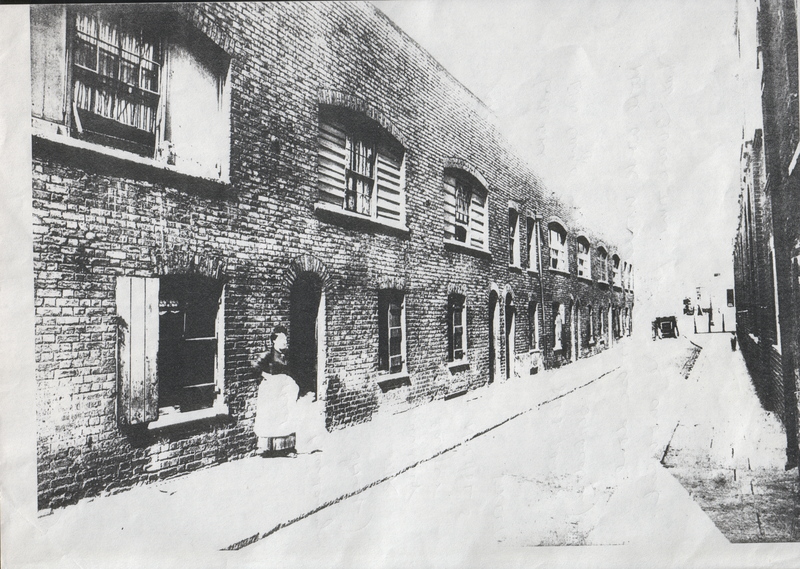 Despite the intention for the estate to house the ‘deserving poor’, only 11 of the original Old Nichol residents were amongst the 5,100 housed in the Boundary Street Estate. Amongst those who were granted properties were policemen, nurses and teachers, as well as ‘ordinary workers’. The Prince of Wales and Princess Alexandra inaugurated the Boundary Street Estate on Saturday 3rd March 1900, when Calvert Avenue was decorated with union flags, masts and streamers, with music provided by the 4th East Surrey Rifle Volunteers. A marquee was erected near Arnold Circus where the Prince delivered his speech to dignitaries and guests, and covered walkways led to selected properties for the Royal party and ticket holders to view. The Old Nichol was dead and the Boundary Street Estate was born.